The iPhone 5 has been discontinued by Apple; this article remains for reference purposes. Here's a list of all the iPhones including the most current. In the upgrade from the iPhone 4 to the iPhone 4S, virtually nothing changed in the design of the phone itself, making one model essentially impossible to distinguish from the other. While there's a family resemblance between the iPhone 5 and the 4S, but they're pretty easy to tell apart thanks to one key factor: screen size. 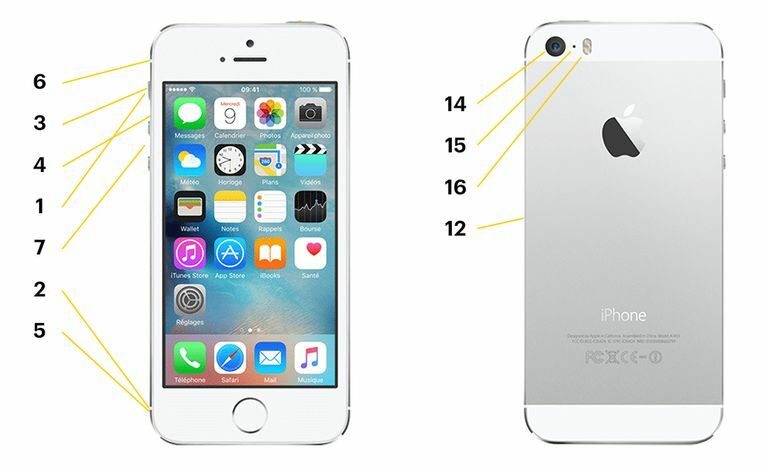 The iPhone 5 stands out thanks to its taller screen, 4 diagonal inches vs. the 4S's 3.5 diagonal inches. Since the size and shape of the iPhone are largely defined by its screen, this makes the iPhone 5 proportionally bigger. Besides the bigger screen, though, here's a rundown of the other key hardware features of the iPhone 5. Ringer/Mute Switch: This toggle switch on the side of the phone lets you put the iPhone into silent mode, for when you want to receive calls but not hear the phone ring. Antennas: These thin lines on the sides of the phone, one at each corner (only two are shown in the image above), are the antennas that the iPhone uses to connect to cellular networks. This placement of the antennas is roughly the same as on the iPhone 4S, which introduced two separate antennas for greater reliability. Front Camera: Centered over the screen (on previous models, it was to the left of the speaker), this camera takes 720p HD videos/1.2 megapixel images and is used primarily for making FaceTime video calls. Speaker: Hold this speaker up to your ear to hear the person you're talking to during phone calls. Headphone Jack: Plug in headphones here to listen to music or make calls without using the iPhone's main speaker at the bottom of the device. Some accessories, such as cassette adapters for car stereos, also connect here. Hold Button: Thanks to its versatility, this button can go by many names: the hold button, the on/off switch, the sleep/wake button. Click this button to put the iPhone to sleep and to wake it up again. Hold it down long enough and a slider appears onscreen that lets you turn the iPhone off (and, no surprise, turn it back on). When your iPhone is frozen, or you want to take a screenshot, the correct combination of the Hold and Home buttons gets the result you're looking for. Volume Buttons: Located next to the Ringer/Mute Switch, these buttons let you raise and lower the volume of calls, music, and any other audio playing through the headphone jack or the main speaker. Home Button: The only button on the front of the iPhone does a lot of things. A single press brings you back to the home screen. A double press brings up the multitasking options and lets you kill apps (or use AirPlay, when available). It's also a key element in taking screenshots, bringing up music controls when the phone is locked, using Siri, and restarting the iPhone. Lightning Connector: One of the more visible hardware changes on the iPhone 5. This port on the bottom is used for syncing your iPhone to your computer and connects accessories like speaker docks. The thing that's different here, though, is that this dock connector, called Lightning, is smaller and simpler than previous versions (for those of you interested in this sort of thing, the new version uses 9 pins, while the previous had 30 pins). Because of this change, old accessories that required the Dock Connector aren't compatible without an adapter. Speaker: One of two small openings at the bottom of the iPhone, covered by metal mesh. The speaker plays music, alert sounds, or calls on speakerphone. Microphone: The other opening at the iPhone's bottom, the microphone picks up your voice for phone calls. SIM Card: The small slot on the side of the iPhone (which can be opened with a "SIM Card remover," aka a paper clip) houses the SIM, or subscriber identity module, which is a chip that identifies your phone to cellular networks and stores data like your phone number. Without it, the phone wouldn't be able to access 3G, 4G, or LTE networks. On the iPhone 5, the SIM is even smaller, using what's called a nanoSIM, as opposed to the iPhone 4S's microSIM. 4G LTE Chip (not pictured): A major under-the-hood upgrade for the new iPhone—one that users never see but definitely experience—is the inclusion of 4G LTE cellular network support. This is the successor to 3G networking and is much faster. Back Camera: The back of the iPhone sports an 8-megapixel camera designed for taking high-quality photos and video at 1080p HD. Learn more about using the iPhone's camera here. Back Microphone: Between the back camera and the camera flash is a microphone, added to the iPhone for the first time with the iPhone 5. It helps pick up audio for the video being recorded using the back camera. Camera Flash: Next to the back microphone and camera is a flash that helps the iPhone take better photos in low-light situations.